March 17, 2017 — “I don’t think I can do this.” The “I” was my friend. The “this” was step into a glass box suspended 103 stories above Chicago. Me, on the other hand, I completely trust engineers. And have massive faith in numbers. That means I have no problem ziplining through Costa Rican forest, crossing rickety-seeming Irish cliff bridges, and driving straight up vertiginous mountains. If somebody knows how to calculate shear capacity, and has already had tens of thousands of paying customers, I assume absolute safety. And all that despite breaking dams, roller coaster deaths, and bridge collapses. 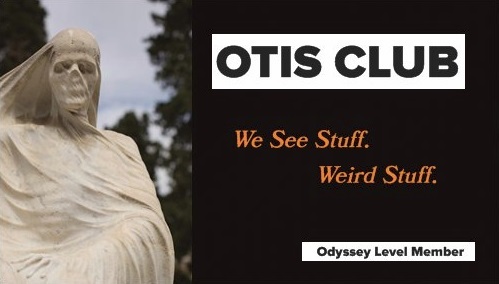 What do you mean, confirmation bias? 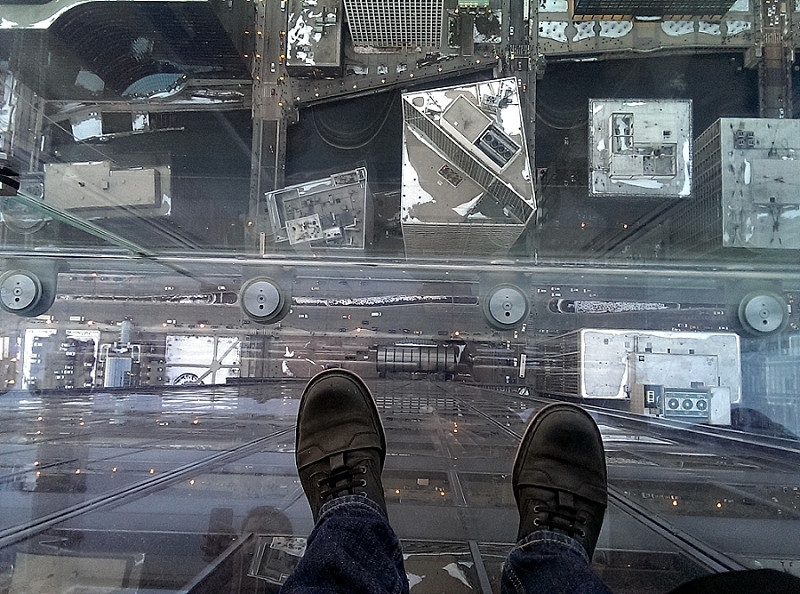 So when I got the chance to try out the Willis Tower Ledge, I jumped at it…er, took the elevator to it. 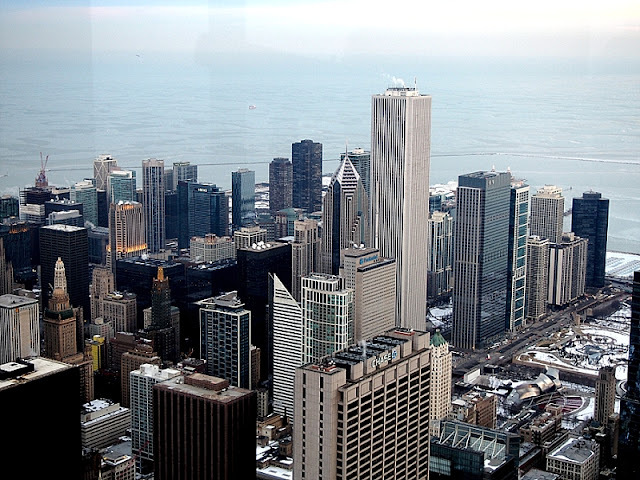 The Ledge is part of the observation deck of Willis Tower, which, at 110 stories, is the tallest building in the Western Hemisphere and the eighth tallest building in the world. The sky it scrapes is at 1,450 feet. The observation deck, called the Skydeck, is on the 103rd floor. That’s where Ferris Bueller and friends leaned their foreheads against the glass on his day off. 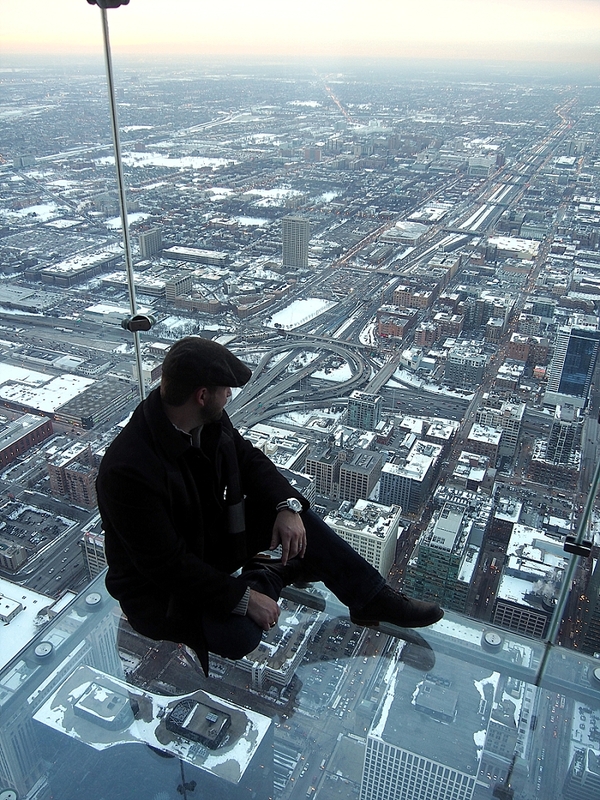 Back then it was the Sears Tower and the terrors of the Ledge were yet undreamt. The Ledge is a series of four retractable rooms that jut out more than four feet from the outside wall of the skyscraper. That means you step into one of these, and, top to bottom, it’s shoe leather, glass plate, 1,353 feet of air. Sounds terrifying, sure. And my friend, who’s more trepidatious about these types of things, was hesitant to hit up the place and I’m pretty sure was just planning to accompany me up to the deck and not step into the glassy void. I mean, he’s no Cameron, but the last time he went on a roller coaster was because I forced him to, and he spent the entire three-hour drive back from the amusement park looking up death and injury statistics on the things. They’re actually pretty scary. As to the Ledge itself, not so scary. But from there, it was a pretty easy step into air. Mostly because each of the four elevator-sized glass rooms already contained four or five people. The wisdom of crowds, you know. My friend even tried it out. And the view, of course, was spectacular. Certainly, my first step into the box felt vertiginous. Despite my faith in modern engineering, the lizard part of my brain briefly objected, telling me that there’s no way this works, despite the 250-pound guy in the corner of it jumping up and down like a frustrated suicide leaper. But eventually I was comfortable enough to just sit down, brazenly ensuring that I wouldn’t be able to jump to safety if I heard a telltale crack. But that couldn’t happen. The box is made up of 1,500-pound panels, each made up of three half-inch layers of tempered glass. Honestly, I don’t know what that means, but I assume engineers do. Despite that time the glass in the Ledge cracked. What do you mean, confirmation bias? All I know is that Chicago looked weird between my boots. And that it was probably safer than the busy street I crossed to get there. 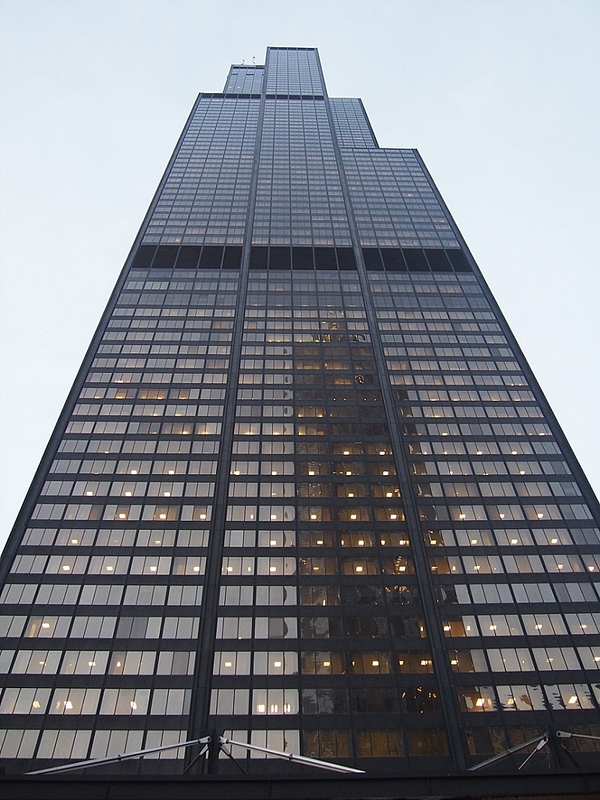 And that next on my docket for vertiginous glass experiences in Chicago is this thing. And that when I do it, I’ll probably be all right.